When: Monday, April 9, 2018 - 3-4:15 p.m. 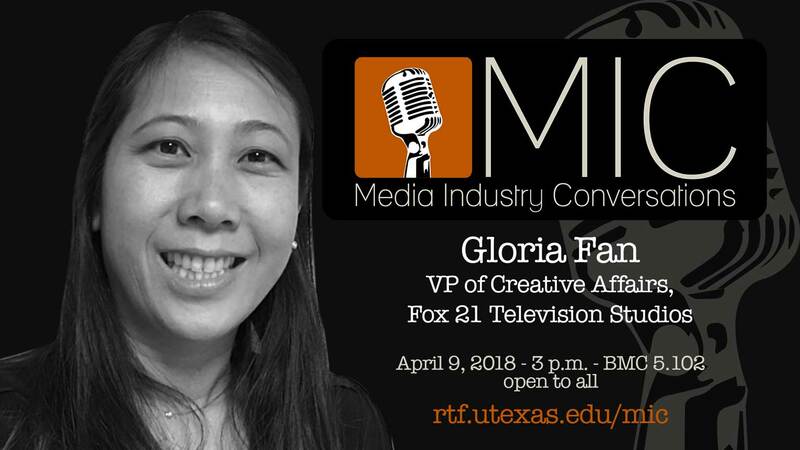 Please join us for a Q&A session where we discuss Gloria Fan's career trajectory, her roles and responsibilities as Vice President for Fox 21 Studios, and her views on the current state of the television industry. Gloria Fan joined Fox21 Television Studios as the VP of Creative Affairs. Some of the shows she oversees include Homeland, Genius: Einstein and upcoming season Picasso, and Ryan Murphy’s American Crime Story and Feud. Plus, along with F/X, launching Kurt Sutter’s Mayans, the spin-off to Sons Of Anarchy. In addition, she is developing several new shows including Hitman (based on the popular video game and films) at Hulu. Previously, she was at CBS where she worked on NCIS and NCIS: New Orleans, plus Stalker (with Kevin Williamson and Maggie Q), as well as oversaw Chuck Lorre’s Mike & Molly (with Melissa McCarthy) and Stephen King’s Under The Dome. Her roots began as a feature producer at Mosaic Productions and Atlas Entertainment where she produced films like Tom Tykwer’s International starring Clive Owen and Naomi Watts and several genre movies like Shutter, Season Of The Witch, and The Lazurus Effect. Gloria has a global perspective as she has travelled around the world in search of stories, artists, and cultural experiences and incorporates it in her daily work. She is also excited how her career path has taken her from producer to studio exec in both TV and film.